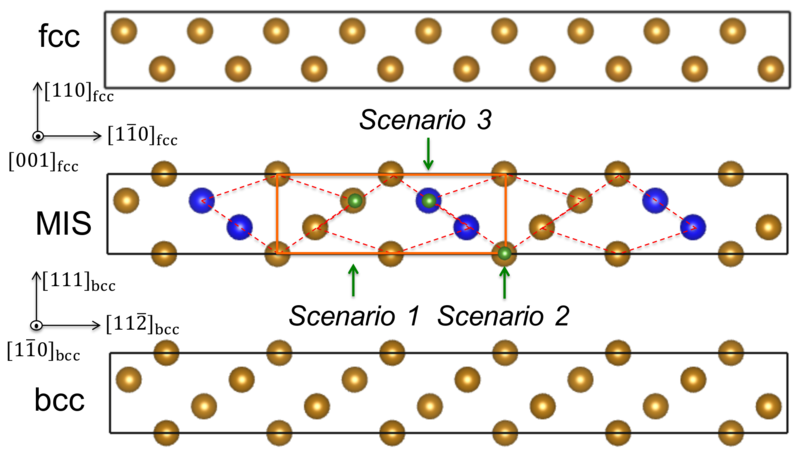 Three scenarios for C redistribution during the transformation from fcc via the metastable intermediate structure (MIS) into bcc Fe. The transformation from the (MIS) involves mainly an atomic shuffle of the corresponding Fe atoms (blue spheres) along the bcc direction. Green, small spheres indicate C atoms. Diffusionless displacive lattice rearrangements, which include martensitic transformations, are in real materials often accompanied by a displacive drag of interstitials. The interplay of both processes leads to a particular atomistic arrangement of the interstitials in the product phase, which is decisive for its performance. An archetype example is the martensitic transformation in Fe-C alloys. One of the puzzles for this system is that the deviation from the cubic symmetry (i.e., the tetragonality) in the martensite resulting from this interplay is lower than what thermodynamics dictates. In our ab initio approach, the relative motion of C in the transforming lattice is studied with the nudged elastic band method. We prove that an atomic shearlike shuffle mechanism of adjacent (11-2) Fe layers along the +/-bcc directions is essential to achieve a redistribution of C atoms during the fcc -> bcc transition, which fully explains the abnormal behavior. Furthermore, the good agreement with experiment validates our method to treat a diffusionless redistribution of interstitials and a displacive rearrangement of the host lattice simultaneously.